Photo by Ales Krivec via Unsplash Creative Commons license. This post was originally published on the USC Annenberg’s Media Impact Project site. It is republished here with permission. Feeding a habit is much easier than breaking one. "In less than two years we doubled our web traffic. At a time when everyone's web traffic was rising, we grew much faster than the industry average." Consider the morning news habit. We wake up, reach for our smartphones before even getting out of bed, and check to see what’s happening in the world. Whereas once that was a printed newspaper or morning TV, now it’s push alerts, Facebook posts, Twitter feeds and destination news sites. The technology has changed, but our habit remains. News organizations working to attract and keep audiences (that’s pretty much all of us, right?) can increase their traffic overall by publishing for the morning habit — posting stories ahead of the spike. A few years ago I was the editor of Gannett’s Salinas Californian newsroom. One of my first steps in our digital transformation was to build a Post and Readership Comparison chart, which showed when readers were on our site and when we published. The trend was dramatic — we published just as everyone was leaving. Very little of what was on our site for the morning news habit — the 8 a.m. spike — was new; most had been written the afternoon before on a print deadline. ​When reporters saw the chart they started asking questions, then thinking, then planning what they could publish ahead of the morning spike. Some rearranged their work hours. 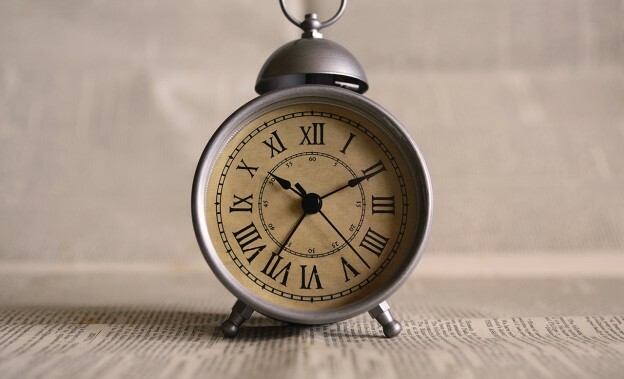 Sunita Vijayan, who was then our courts reporter, decided she’d come to work earlier, publish a couple of quick posts about what court cases she’d be covering that day, and include a note to readers to check back later for updates. “Early and often,” as we hear in Mic’s editorial meeting. 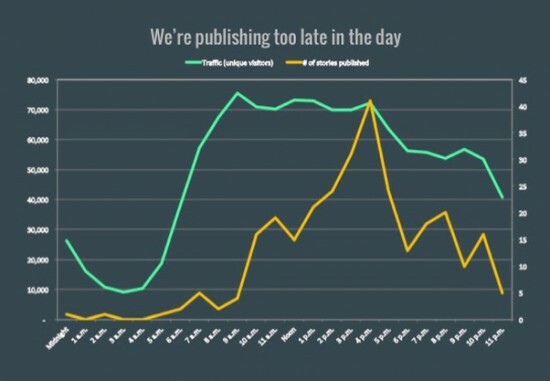 I’ve used this Post and Readership Comparison chart in a couple of newsrooms since then, and each time it inspires a change in how we publish and leads to an increase in traffic. Now, what does your traffic pattern look like? Learn your spikes — mobile, desktop and social media — and test this idea to see if it works for you. And even more than increasing traffic (page views), does it intensify your stickiness (return visits, average time spent per person)? Stickiness leads to loyalty, to subscribers, donors, members and brand ambassadors — whatever your long-term goal. Big, breaking news drives traffic regardless of time of day and shouldn’t be held, but for everything else there’s a spike waiting to be explored. Anjanette Delgado is an audience analyst at Gannett and http://lohud.com. She also writes for USC Annenberg’s Media Impact Project. I’ve heard this before but it seems to me that it’s not so important when you post but rather when you promote on social media, right? Or am I missing something?